It is hardly possible in real life to develop a good machine learning model in a single pass. ML modeling is an iterative process and it is extremely important to keep track of your steps, dependencies between the steps, dependencies between your code and data files and all code running arguments. This becomes even more important and complicated in a team environment where data scientists’ collaboration takes a serious amount of the team’s effort. Today, we are pleased to announce the beta version release of new open source tool — data version control or DVC. DVC is designed to help data scientists keep track of their ML processes and file dependencies in the simple form of git-like commands: “dvc run python train_model.py data/train_matrix.p data/model.p”. Your existing ML processes can be easily transformed into reproducible DVC pipelines regardless of which programming language or tool was used. The full pipeline could be built by running the bash code below. If you use Python version 3, please replace python to python3 and pip to pip3. # Download a file and put to data/ directory. # Extract XML from the archive. # Split training and testing dataset. Two output files. # 0.33 is the test dataset splitting ratio. 20170426 is a seed for randomization. # Extract features from text data. Two TSV inputs and two pickle matrixes outputs. # Train ML model out of the training dataset. 20170426 is another seed value. # Evaluate the model by the testing dataset. # Improve feature extraction step. # Commit all the changes. # Reproduce all required steps to get our target metrics file. Data item “data/evaluation.txt” was reproduced. # Take a look at the target metric improvement. If you replace the input file that affects all the steps, then the entire pipeline will be reproduced. # Replace small input dataset (25K items) to a bigger one (100K). # Reproduce the metric file. Not only can DVC streamline your work into a single, reproducible environment, it also makes it easy to share this environment by Git including the dependencies (DAG) — an exciting collaboration feature which gives the ability to reproduce the research results in different computers. 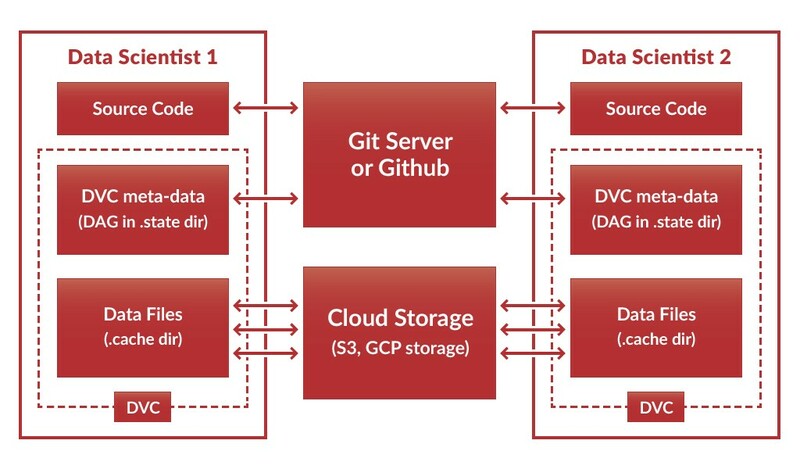 Moreover, you can share your data files through cloud storage services like AWS S3 or GCP Storage since DVC does not push data files to Git repositories. # Share the repository with the pipeline and the cloud settings. # Share the most important data files. Now, another data scientist can use this repository and reproduce the data files the same way you just did. If she doesn’t want (or has not enough computational resources) to reproduce everything, she can sync and lock shared data files. After that, only the last steps of the ML process will be reproduced. # Sync the data files from S3. # since these data files were synced. # Reproduce required steps of the pipeline. Thus, the model can be improved iteratively and DVC simplifies the iterative ML process and aids collaboration between data scientists. We are very interested in your opinion and feedback. Please post your comments here or contact us in twitter — FullStackML. If you found this tool useful, please “star” the DVC Github repository. Bio: Dmitry Petrov is building the future of data science tooling DataVersionControl. Ex-Data Scientist at Microsoft. Ex-Researcher. PhD in CS.